Assoli di chitarra is an Italian language guitar related website. It is dedicated to all Italian lovers of the guitar, featuring lessons and resources for players that are easy to understand because it is in their first language. By visiting the site, y ou get free tools for guitar, there are various lessons of guitar and you can also download a number of manuals that will help you as you make your way towards Italian rock stardom. 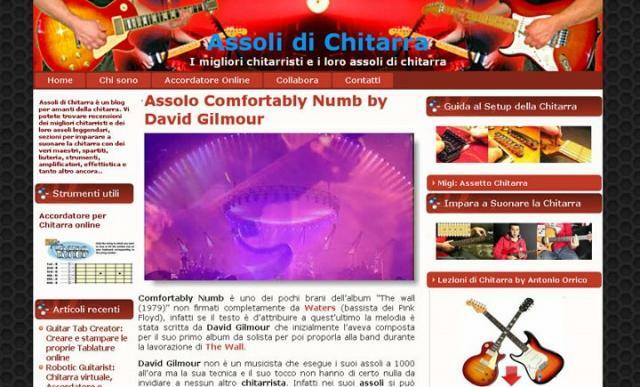 Assoli di chitarra è un sito italiano per amanti della chitarra. Vi potete trovare tantissime risorse gratuite per chitarristi e tutto quello che serve per iniziare a suonare la chitarra. Moltissimi strumenti utili al chitarrista e tante guide per imparare a suonare e a usare gli effetti per chitarra.